Walk onto the campus at Carnegie Mellon University and one of the first things you’ll see is how the college has been shaped by construction. With its pale stone, tall arches and classical pediments, the iconic College of Fine Arts is home to beautiful nineteenth century-style architecture that has inspired students for decades. But tours now begin across campus in the new Tepper Quad, which has been specially designed to meet current students’ needs. Featuring advanced auditoriums, an 8,000 square-foot start-up incubator, multiple breakout areas and tons of natural light, the Tepper Quad showcases how universities are using their facilities to give students the best experience possible. Approximately 67% of students consider the quality of school facilities as a critical factor in their enrollment decisions, according to the Association of University Directors of Estates. Across the US, universities like Carnegie Mellon and Wake Forest are investing in both renovations and new buildings to attract new students. Construction spending in the education sector totalled $92.4 billion in 2017 and rose a further 3.8% in 2018. However, construction within the university setting can present unique challenges that may hinder success, both during the construction phase and the longer-lasting project lifecycle of a building. While tackling these challenges, universities must also ensure often limited funds and resources are used as efficiently as possible to deliver the best value for the institution and its students. The multitude of combinations happening at any given time on a university campus – renovation, expansion and building from scratch – often create hugely complex construction projects. The multitude of combinations happening at any given time on a university campus – renovation, expansion and building from scratch – often create hugely complex construction projects. This means a wide range of subcontractors and specialists may be actively working on multiple sites across a campus, all racing towards a completion deadline. The complexity of this dynamic creates particularly challenges with information sharing, as campuses can cover enormous areas; for example, the University of Arlington in Texas sits over 420 acres. Distributing information and ensuring that everyone is working from the latest version of plans can be extremely difficult, increasing the risk of miscommunication – and mistakes. These errors often represent a significant drain on a university’s budget. Rework caused by problems with information sharing cost the US construction industry over $31 billion in 2018. Timescales are also critical. Projects are often conducted around the restrictions of the academic year, and it’s imperative that facilities like student housing are ready in time to be used. Delays are very damaging, both in costs and the quality of life around campuses. The difficulties don’t end with construction. Schools must be able to service buildings during their lifecycle to keep them working well and preserve their aesthetic appeal, particularly as campuses continue to grow. And given universities’ responsibility for safety of all those on its campus, it’s vital that issues related to the built environment can be immediately identified and addressed to protect staff and students. To improve the efficiency and effectiveness of buildings throughout their lifecycle – from construction to close-out and maintenance – universities are turning to construction technology. Mobile collaboration tools enable real-time communication between teams spread across university grounds, as well as create in-depth digital records of campus grounds for its ongoing upkeep. Improve productivity – Teams can access and collaborate on the latest project data using any device, minimizing the time spent chasing paper across campus and ensuring they build right first time. Keep projects on time and on budget –Project managers can highlight issues and assign responsibility for fixes, enabling them to swiftly rectify problems and stay on schedule. Create a comprehensive campus record – Construction work is recorded as it is completed, providing comprehensive and easy-to-access data for schools to support maintenance and future expansion. Effectively manage safety and service protocols – Maintenance teams can easily photograph issues, pin them to plans, assign responsibility and a due date for completion, improving response times and ensuring student safety is never compromised. 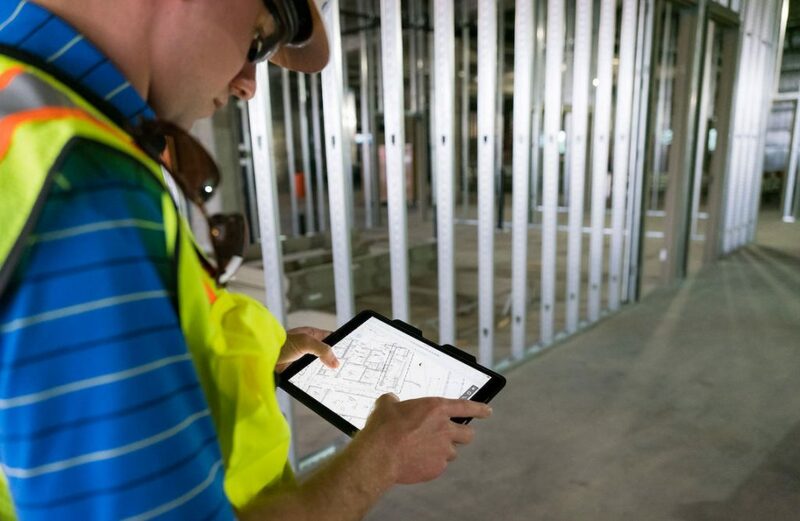 Learn more about how PlanGrid supports construction in the higher education sector. With construction technology, universities improve the productivity of their building projects to ensure they are delivering the best long-lasting value for the institution. Throughout the lifecycle of campus facilities, digital tools will support efficient, timely maintenance — keep these places beautiful locations to live, learn and work. Like the institutions themselves, university campuses are designed to strike a balance between respecting the past and looking to the future – from stone arches to advanced labs. And with digital tools, universities can preserve and enhance their campuses for generations of students to come.